They say variety is the spice of life! So to make the month of May nice and spicy I have dedicated the entire month to the four stamp 1975 Monaco series celebrating the 100th anniversary of the opera Carmen. The set was issued on 13 May and it was designed and engraved by Albert Decaris. 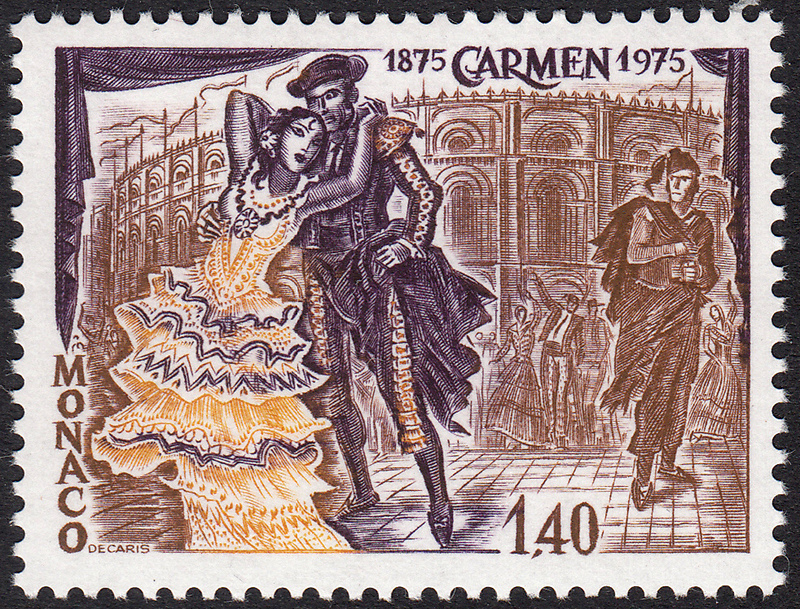 Since Carmen is in four acts and each of these acts has been illustrated with its own stamp, each week's blog has been a "one act wonder" so to speak. This week it is time for Act IV. The finale! If you wish to review any or all of the story so far, here are the links to each Act of the opera. Act I. Act II. Act III. As I have mentioned in the previous three blogs dedicated to this opera, Carmen is a tale of seduction, passion, infidelity, jealousy and murder. It was first performed at the Opéra-Comique in Paris on 3 March 1875. It was considered quite scandalous for its time! Act III ended with José heading back down to the town after having been convinced that his mother is ill and needs him. But before he leaves he tries to prevent Carmen from rushing off into the arms of Escamillo. Let's see how that panned out! The lights come on. We are in the square in front of the bull-fighting arena at Seville, Spain c. 1920. It is the day of the bull-fighting contest. The square is jam-packed with people. Merchants are crying their wares. Gypsies are performing for the crowds. It's party-time! The attention soon focuses on the two friends of Carmen, Frasquia and Mercédès. They are talking to the soldier, Zuniga (he is the guy José has had a couple of entanglements with). They tell him that Carmen is now with Escamillo. Then the bull-fighters arrive and the crowd goes wild. Carmen is indeed with Escamillo. They openly express their love in front of the crowd. Carmen cries out that she has never loved anyone as much as Escamillo. As Escamillo goes into the arena surrounded by screaming fans, Frasquita pulls Carmen aside and warns her that José is somewhere in the crowd. Carmen looks at her and blows her off. She turns, about to enter the arena, when José appears and grabs her. He is desperate. She tries to pull away but he begs her to stay with him. He says that they can move away and have a new life together. If only she will love him back. She pauses, perhaps considering the request. But then she tells him quite bluntly that she does not love him at all. Suddenly cheers erupt from the arena in the background. Carmen desperately wants to go in, but José, relentless, won't let her. He begs her yet one more time. This time Carmen replies with a scornful rebuke. José becomes incensed. Then, as the crowds in the arena are chanting the name "Escamillo" José pulls out a knife and plunges it into Carmen's heart (I am assuming heart!). As Carmen drops to the ground dead, a chorus of the "Toreador Song" can be heard in the background. José kneels over the body of Carmen, declaring his guilt over her murder, as the crowds pour out of the arena. We are then left to ponder the fate of José. Is he punished by the law for his deed? Does Escamillo take revenge on the killer of his lover? Or does José flee to live out the rest of his life in guilt-ridden torment? Time to reveal the Act IV - and final - stamp! What a beautiful stamp! In he foreground we see Carmen and Escamillo in a lovers' embrace. While off to the right, we see José staring them down, perhaps plotting some way of winning back the love of Carmen? Just check out the engraved detail of Carmen's dress. Not to mention the gorgeously-rendered bull-fighting arena in the background. Just...Wow!